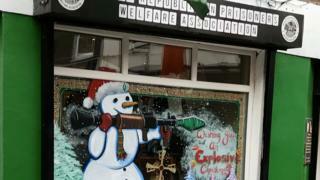 Image caption The window display included the message "wishing you an explosive Christmas"
A 29-year-old man has been charged after a snowman holding a rocket launcher was painted on the window of a republican support group's office in Londonderry. The image included the message: "Wishing you an Explosive Christmas." It appeared at the office of the Irish Republican Prisoners Welfare Association in Chamberlain Street. The man has been charged with two counts of permitting display of anything provocative. It follows the appearance of the display in October. The Police Service of Northern Ireland said the man is due to appear at the magistrates' court in Derry on 3 January. All charges will be reviewed by the Public Prosecution Service for Northern Ireland.